Larry Ellison, executive chairman and CTO of Oracle. It appears that one of the tactics being used by Larry Ellison and his minions to sell the cloud is a new twist on the old protection racket. This shouldn’t surprise. Ellison didn’t become California’s richest person by playing nice — it doesn’t work that way. Indeed it is, and its tactics are beginning to resemble an extortion racket, with suited Oracle thugs threatening, “Nice database you have here. It’d be a shame if something happened to it.” The leverage the company has to make this tactic work is our old pal, vendor lock-in. The problem for Oracle is that it’s finding it difficult both to find new customers for its proprietary stack and to keep its installed base from fleeing, as the company’s flagship products are under increasing pressure from open source software and from the cloud. Jack Clark wrote about the pressure from open source about a month ago in an article for BloombergBusiness. He points to Powa Technologies Ltd., a mobile payments company located in the U.K., which about a year ago began moving from Oracle and IBM products to open source software. The limited migrations attempted so far have proved to be so successful that the company is now in the process of moving almost all of its operations to free software. Open source software also doesn’t come with the threat of visits from the software vendor’s goon squad for a software audit. To stem the flow of the installed base away from Oracle and into the arms of open source and other companies’ cloud services, Oracle has been pushing its own cloud. The trouble is that it was late to the cloud game, and has been playing catch-up to compete with IBM, Salesforce, Amazon and Microsoft’s established services. The company has been working to boost its cloud on many fronts. On Friday, for example, Investopedia reported that the company has partnered with Xamarin for its new Mobile Cloud Service, giving Oracle access to a massive amount of mobile app development resources, which includes the delivery of iOS and Android mobile apps by way of the cloud. 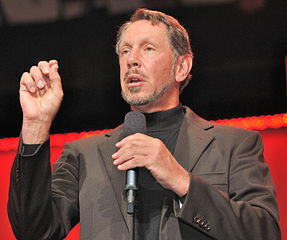 But that’s not the only way that Oracle is seeking to boost its cloud business. It’s also playing down and dirty with its installed base, using software audits as its tool. These days, Oracle is using audits to aggressively sell cloud services to its existing base — even to customers who have no interest in moving to the cloud. One of the methods used is to lower massive penalties for being out of compliance in exchange for signing up for cloud services. Another method takes advantage of vendor lock-in by using the “breach notice,” which is what Business Insider meant by “nuclear option,” as it gives the customer the chance to walk away from a costly contract scot-free. According to Craig Guarente, who spent sixteen years doing contract and auditing work for Oracle before founding Palisade Compliance, which helps Oracle customers stay in compliance, the massive use of the breach notice is something new. Oracle actually stands to gain very little from the cloud contract alone. For the contract to be valuable, the client must actually begin using the cloud. Evidently, Oracle is hoping that with this foot in the door, when a client finally makes the decision to go with the cloud, they’ll go with the cloud they already have instead of looking elsewhere. However, this strategy could backfire. Some companies might resent being forced to sign a contract for a product it doesn’t want or need in order to stay in business and start looking for options to Oracle. When they do, they’ll find them in open source software. Great article, but please correct your “it’s” to “its” – makes for more credibility! One possible motive for Oracle’s recent “extortion type” tactics is an aggressive move by many former Oracle Database clients to Free/Open Source Software (FOSS) PostgreSQL Object/Relational Database. Since much of the SQL programming operations are similar between the 2 databases, EnterpriseDB – a commercial solution provider for PostGreSQL worked with other entities to secure – by way of a 1 $million bounty – a very comprehensive and successful “migration tool set” which allowed Oracle customers to move to PostgreSQL/EnterpriseDB with minimum of time and complications/problems. The program appears to have some success, since EnterpriseDB indicated at the recent Cloud Computing Expo in New York City, that migrations from Oracle were up significantly, and the EnterpriseDB version of PostGreSQL was highly rated in latest Gartner “Magic quadrant” report postings. No quotes needed, extortion is an apt description for Oracle’s behavior. Never saw an Oracle product that worked as advertised. they are running it on MS so who cares. Larry cheats at boat racing too.